Fashion is a fickle business but right now Britain is in vogue. Luxury U.K. labels like Mulberry and Burberry (BURBY) are hiring scores of apprentices and other companies are bringing production back home. Young tailors are once again being schooled in the art of suit making on London's Savile Row. And Asian shoppers will pay more for clothing "Made in Britain." These are welcome signs of life for Britain's textile industry -- once an engine of the U.K. economy but in decline since the 1970s as firms moved to China or India to take advantage of lower costs. Employment in U.K. manufacturing has risen for 20 months running, according to official figures, as companies invest in machinery and skills. Experts say businesses are discovering the advantages of reshoring production -- they can bring products to market faster, and charge a premium. "There is an air of confidence that I haven't seen in years," said Kate Hills, who runs Make it British, a company that connects designers with U.K. manufacturers. For the first time in five years, producers are investing in new equipment such as state of the art digital printers and weaving looms, Hills said. While "Made in Germany" is still the brand to beat in many areas of manufacturing, British-made goods are increasingly seen as a mark of quality in textiles. 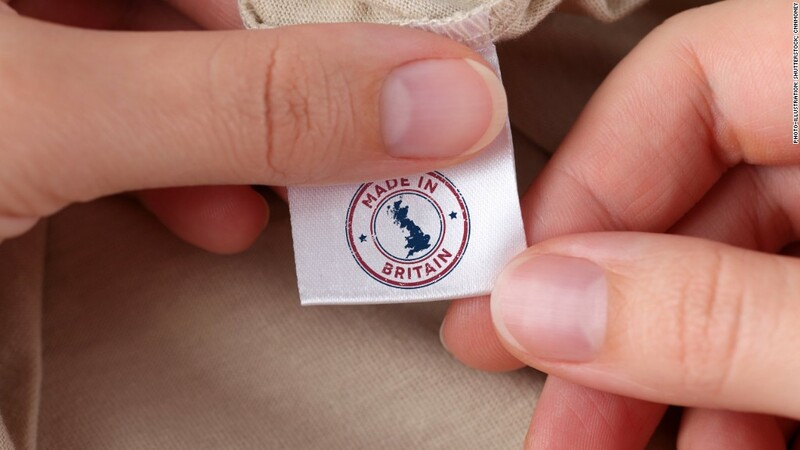 Exporters could unlock up to £2.1 billion ($3.3 billion) in potential revenues by branding their products "Made in Britain," according to a recent report by Barclays. The U.S. -- the U.K.'s largest export market -- represents the greatest single opportunity at $800 million in potential earnings, according to Barclays. But the highest premiums can be found in Qatar and China. Consumers there are willing to pay up to 7% more for products from the land of the Royal family and James Bond. Demand for British-made goods isn't limited to the export market. Lingerie and sleepwear maker Headen & Quarmby brought all production back to England from Asia to gain greater control and proximity to its U.K. customers. Sock maker Roy Lowe & Sons has also pulled some of its production back to Britain to get its wares in stores faster. Both companies said reshoring helped satisfy demand for locally-made goods. The global appetite for British-made products is driving investment in skills at some of the country's biggest luxury names. High-end leather goods maker Mulberry has run its apprentice program since 2006. 70 young workers have graduated. Burberry began hiring apprentices in 2010 at a factory in northern England where the brand's iconic trench coats are made. Traineeships are also flourishing on Savile Row. The London street is the global destination for style-conscious men willing to pay upwards of $3,500 for a bespoke suit. For centuries the home of British tailoring -- and responsible for dressing the likes of Prince Charles and Benedict Cumberbatch -- has made its suits on site. But skills were drying up as the bulk of its tailors neared retirement. An apprenticeship program was set up that will turn out its 50th graduate this year, reviving a craft that was at risk of disappearing.